6th December 2011 Players please note that on Friday 27th January there will be rehearsals both for HCO (initial rehearsal for Truffaldino, in the hall with Peter) and for HSO strings (upstairs with Rob Hodge). See the Rehearsals page for additional details. 5th December 2011 What a fine concert to begin the HSO’s 50th season! writes Mike Allen in The News. See our Reviews page for a link to the full review. 4th December 2011 Not only did our chairman Tony Gutteridge walk 1000 miles this year, raising more than £1000 for the orchestras, but he also managed to get us extra publicity in the form of an article in the News accompanied by a photo taken at rehearsal which you can see below. 25th November 2011 Players please note that the originally scheduled HSO rehearsal on Friday 9th December is now cancelled (mainly because the relevant music is currently out on hire so we can’t make an early start on it). Players are also reminded again that the HSO rehearsal on Friday 2nd December, the day before the concert, is at Oaklands. Players are asked to use the north entrance (by the primary school) and park behind the hall, as described on the Directions to Oaklands page. 21st November 2011 The website changes to make it easier to read multi-column pages on narrow screens caused problems with older browsers – sorry! We’ve gone back to using a more widely supported method of switching to single-column mode for narrow screens which works in most modern browsers such as Firefox, Safari, Chrome and Opera, but this method doesn’t work in Internet Explorer (at least up to version 9). 20th November 2011 Many small changes have been made to the internals of this website in order to make it easier to view on narrow screens, especially on mobile devices. Various pages such as programme notes, the Welcome page and parts of the latest newsletter now use multiple columns for improved readability when displayed on wider screens, but switch to single-column mode when there is insufficient space. Menu buttons should now shrink to help fit the menu on narrower screens. If you spot any problems with these changes, please send a note to the webmaster, mentioning which browser and version you are using (for example Internet Explorer 9). 18th November 2011 The Havant Orchestras Newsletter for December 2011 is now available, including details about the arrangements at Oaklands Catholic School for the HSO concert on 3rd December. ‘Karen is an outstanding pianist, but one of that under-appreciated breed whose role rarely catches headlines; as piano soloist, accompanist, chamber musician and teacher, she is invaluable in the music community’. The winners this year were Portsmouth Festival Choir. More details of the awards evening, including a video of the event, can be found in the article on the News website. The section with Karen starts around 21 minutes into the video. There was also a special award for Mike Allen, who has been writing reviews for The News for many years, including some very complimentary reviews of Havant Orchestras concerts. 14th November 2011 The concert programme pages starting from the HSO December concert now have associated pages giving soloist biographical details and extracts of programme notes. These are just a small part of the information to be found in the Havant Orchestras Programme book for this season, which is available for £3 in the foyer at concerts. For additional information, the title of each work in the programme notes is linked to a web page (for example in Wikipedia) for the specific work or the composer. 13th November 2011 Directions to Oaklands Catholic School (for the HSO concert on 3rd December 2011) are now available from the concert programme page. Players please note that the rehearsal the previous night, Friday 2nd December, is also at Oaklands. Players are asked to use the north entrance (by the primary school) and park behind the hall, as described further down the Directions page. 10th November 2011 Peter Craddock plans to retire as conductor of the HSO at the end of next year, so we will need a new HSO conductor for 2013. Steve Bartholomew is co-ordinating the recruitment and selection process, and has provided more details in a news update below. 5th November 2011 You can now join a mailing list to receive email updates to remind you when a Havant Orchestras concert is coming up and to call attention to other important or interesting news on this website. For details, see the Getting email updates page, which can also be reached via the Get Updates button on the home page. 19th October 2011 The Portsmouth News has published a very complimentary review by Mike Allen of Saturday’s HCO concert. A link to the review has been added to our Reviews page. 7th October 2011 The Havant Orchestras Newsletter for October 2011 is now available. This includes information about a programme change for the 15 Oct 2011 concert. 10th September 2011 The Bob Harding Bursary auditions were held on 8th July, when the Havant Symphony Orchestra enjoyed being rehearsed by three excellent post-graduate student conductors. The bursary for the 2011-2012 season has been awarded to Robert Hodge and we are eagerly looking forward to working with him during this season. 10th September 2011 We are very pleased to announce that the Rt Hon David Willetts, MP for Havant, has accepted our invitation to be President of the society for our 50th anniversary season. The Mayor of Havant and the Mayor of Fareham have also kindly accepted invitations to be patrons of the Havant Orchestras during this special season. We hope to see each of our distinguished guests at a Havant Symphony Orchestra concert during the year. 9th July 2011 To help players with advance planning, the provisional concert and rehearsal dates for the 2012-2013 season are now available in the public part of the Members area. 4th July 2011 A glowing review by Colin Jagger of Saturday’s HSO concert has appeared on the Portsmouth News site. A link to the review has been added to our Reviews page. 24th June 2011 The Havant Orchestras Newsletter for July 2011 is now available. 22nd June 2011 On Tuesday 21st June at 21:45 on Radio 3, Robert Blanken (our 1st clarinet), Karen Kingsley (piano) and Richard Moore (bassoon) could be heard in the world premiere broadcast of a trio by Anthony Hedges called Three Humours for Clarinet, Bassoon and Piano, in association with the "Light Fantastic" project. This was included in Tuesday’s "Radio 3 Live in Concert" programme (featuring Simon Rattle and the Orchestra of the Age of Enlightenment) which was available on BBC iPlayer for one week, but is no longer available. The three movements are entitled Joie de vivre, Contemplation and Celebration. The composer has made the sheet music available (for non-commercial use – see the copyright notice) on IMSLP here. 20th May 2011 There is now a Havant Orchestras page on Facebook. If you use Facebook, we hope you will "Like" it! Within this website, there are now buttons which will take you to corresponding pages in Facebook, so concert programme pages link to our Facebook event pages (and vice versa) and the home page links to the Havant Orchestras "wall". 18th May 2011 A complimentary review by Terry Barfoot of the recent HCO concert has appeared on the Portsmouth News site. A link to the review has been added to our Reviews page. 17th May 2011 To reduce the size of this news page, older news items have now been moved into separate archive pages for previous years. 17th May 2011 Some internal changes have been made to the way this website works in order to make it easier to maintain and extend, and to make it look better on current browsers. Older concert programme pages are now automatically displayed in a similar format to current ones. The concert programme pages for 2007-8 were still on the website but not linked in, so they have now been put back in the menus for historical interest. Please let the webmaster know if you spot any problems or have any comments on the website. 15th May 2011 You can now listen to a short extract of Havant Chamber Orchestra playing during a rehearsal for their recent concert. 15th May 2011 The full rehearsal schedule for the 2011-2012 season is now available in the public part of the Members area. 15th May 2011 The concert programme details for the 2011/12 50th Season are now available on this web site, along with the booking and season ticket information for the new season. 7th May 2011 The Havant Orchestras Newsletter for May 2011 is now available. 28th April 2011 Our recent soloist Viv McLean (HCO Feb 2011) has kindly sent us some very complimentary comments which have been added to the Reviews page. The page now also includes a list of links to some other review articles available on line, in particular at The News, Portsmouth. 22nd April 2011 Mozart’s 19th Piano Concerto (K 459) is the link bringing three former colleagues at South Downs College Music Department together for the HCO concert on Saturday 14 May. See the article from our recent press release below: "Three Former Colleagues Re-united by Mozart". 21st April 2011 Programme and ticket details are now available for the HSO Concerto Evening. This is an exciting evening of concerto items contributed by players from the Havant Symphony Orchestra, taking place at Hayling Island Community Centre on Friday 10th June. Note that the start time is 7.00pm (the usual HSO Friday rehearsal start time) – don’t be late! 21st April 2011 HSO players, please note that additional details are now on the rehearsals page about the rehearsals for the July concert and about the rehearsal and programme for the Concerto Evening on 10th June. 28th March 2011 The date of the Friends’ Garden Party has been changed to Sunday 19th June. 19th March 2011 The March 2011 Friends’ Newsletter is now available on the Friends’ News and Events page. 18th March 2011 The Havant Orchestras Newsletter for March 2011 is now available. 23rd February 2011 HSO players please note: The HSO rehearsal on Friday 29th April is cancelled because of the Royal Wedding. There will instead be rehearsals on Friday 1st April (full rehearsal) and on Friday 8th April. See the Rehearsals page for up-to-date information. 5th February 2011 The Havant Orchestras Newsletter for February 2011 is now available. 5th February 2011 The February 2011 Friends’ Newsletter is now available on the Friends’ News and Events page. 29th January 2011 To help players with advance planning, the provisional concert and rehearsal dates for the 2011-2012 season are now available in the public part of the Members area. This web site now includes a new Events page which summarizes future events. The page menus have also been slightly reorganized, in that the buttons for the Friends, Hire Library and Links pages have been moved to a second-level menu on the Welcome page, together with a new Kids button for future information about the Upbeat Club. Please let the webmaster know if you have any comments or suggestions for further improvements. 22nd January 2011 Geoff Porter (Friends’ secretary) has informed us that HSO’s recording of Elgar’s Wand of Youth Suite No. 2 will be featured in his Elgar programme on Angel Radio on Sunday 30th January at 10.30am, 101.1 FM (in the Havant area) and on line. 21st January 2011 Some changes have been made to this web site, especially on the home page. The home page now includes a Google search box and space for more detailed additional information, and has been modified to make it easier to read on narrow screens or with large text sizes. Please let the webmaster know if you have any comments or suggestions for further improvements. 2nd January 2011 Happy New Year! The Havant Orchestras Newsletter for January 2011 is now available, containing the details for the January HSO concert rescheduled from December. Not only did our chairman Tony Gutteridge walk 1000 miles this year, raising more than £1000 for the orchestras, but he also managed to get us extra publicity in the form of an article about his walk and the HSO 50th anniversary, published in the Havant edition of The News on Wednesday 30th November, just before our December concert. 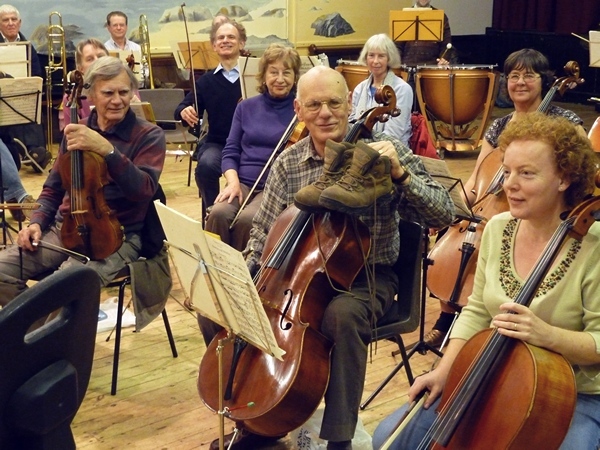 The article was accompanied by this photograph, taken at the previous Friday’s rehearsal, of Tony with his walking boots (not normally required in orchestra rehearsals even for playing Sibelius, but useful for identifying which of the players is Tony), as requested by The News. Many of you will already know that Peter Craddock intends to retire as conductor of the Havant Symphony Orchestra after the December 2012 concert. The great news is that he is staying as conductor of the Havant Chamber Orchestra for the foreseeable future. The process for finding a successor for the HSO is well underway. A small subgroup of the Committee has already identified several experienced and capable candidates who have indicated their interest. The next step is for informal face-to-face discussions with each of them to enable us to draw up a small but very select short-list, each of whom will be given an opportunity to conduct the HSO in rehearsal later this season. We hope to offer two candidates a concert next season as Guest Conductor which will add extra excitement to the March and July 2013 concerts. If all goes according to plan, we then hope to make a long term appointment from the 2013–2014 season. If you would like to know more about the requirements and process for finding the new HSO Conductor, please see the Information for Prospective Candidates (PDF) document. We have been experimenting with making recordings of some orchestra rehearsals so that you can hear extracts of the works we are performing. Here is a short extract from a Havant Chamber Orchestra rehearsal for the 14th May concert. Click on the title in the playlist to start the extract. This requires the Adobe Flash Player; if it is not yet installed, your browser should try to install it automatically, in which case you may need to permit the installation by responding to a prompt or clicking on a bar at the top of the browser window (or both). The Flash application being used in this case is Jerome Wijering’s JW Player, which can play MP3 files from a predefined playlist. 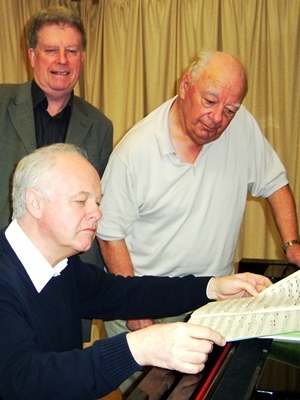 Terry Barfoot and Peter Craddock consider the score with Peter Rhodes at the piano. Mozart’s 19th Piano Concerto (K 459) is the link that will bring former colleagues at South Downs College Music Department together in Havant Chamber Orchestra’s concert at Ferneham Hall, Fareham on Saturday 14 May. For former lecturer Terry Barfoot, now the director of Arts in Residence and a very successful musical author, lecturer and educator, it is a welcome return to the Havant Orchestras’ scene to give the pre-concert talk about the Concerto (at 6.30pm). Next comes Peter Craddock also a former lecturer at the College, who retired several years ago and is still Musical Director of the Orchestras to conduct the Concerto. Finally, Peter Rhodes will take the soloist’s part in the Concerto. He is probably best known in this part of the world as the current and very busy Head of Performing Arts at the College but in the wider field of professional music he is a recital and concerto pianist, harpsichordist and conductor in addition to accompanying international singers including Dame Kiri te Kanawa and undertaking work in operatic and musical theatre productions. The concert will begin at 7.30pm with Ravel’s exotic Suite Le Tombeau de Couperin followed by music from the first part of Manuel de Falla’s ballet The Three-Cornered Hat. After the concerto and the interval, the final work will be Beethoven’s 8th Symphony which will be conducted by Samuel Draper the Orchestra’s Bursary Holder. Before the concert younger listeners are invited to join in the activities of the Upbeat Club at 6.30pm and there will be a Musical Interlude for everyone at 7.00pm by clarinettist Emmeline Foster, a student at South Downs College, until the concert begins at 7.30pm.